Why choose a contact by email? 1. Are your products made in France? 2. Which marking technique should I choose? 3. What is the quality of your products and markings? 4. What are the products displayed in the Artshop section? 5. How can I customise a product? 6. How to order ? 7. How to choose my size? 8. What are the secure payment methods available? 9. Are your rates decreasing? 10. I can not put a product in my cart or validate an order? 11. What are your deadlines? 12. In which countries can I be delivered? 1. Can I cancel or modify an order? 2. How to change the delivery address? 3. How to know the status of my order? 4. How to track my package during delivery? 5. What if my package is not delivered to me? 6. What if my package is damaged? 7. How to make a return? 8. I received my order, there is an error or a problem with my marking? 9. The size of my product is not suitable, what to do? 10. I need my order for a specific event, how can I do? 1. What is a reseller? 2. What is the difference between the 3 proposed sales methods? 3. What is the Designer mode? 4. How am I paid on the sale of designs as Designer? 5. As a Designer, can I choose the products I want to display my designs? 6. Can I choose the colors of the products on which I would like to display my designs? 7. Are all my designs instantly available on your site? 8. What are the purpose of the descriptions, titles, tags and categories to define for each design? 9. What is a campaign? 10. What is the purpose of selling the campaigns? 11. Are my campaign customers being charged right away? 12. How are the campaign commissions calculated? 13. What are the production and delivery deadlines for the various reseller modes? 14. Are you cheaper than the competition? 15. What is an Tunetoo online shop? 16. Are you compatible with Shopify or Woocommerce modules? 17. What are the commissions via the online shops? 18. Do we have a sliding scale if our shop sells volume over the year? 19. Can we use multiple reseller modes in parallel? The satisfaction of our customers is our priority, that’s the reason why we do our best to help you throughout your shopping experience. We have created this page for you, which gathers a multitude of answers on the questions you may ask yourself. We invite you to take a look, if you do not find the answer to your question, we will be happy to help you. Via the instant messaging service available from our website. You simply have to click on the « Help?» located at the bottom right of our pages. Via the email address sav@tunetoo.com: We make a point of getting to answer all your requests. The answer is usually within 24 hours. Via our telephone line at +33 5 56 31 09 55: We are open from 9:00 to 13:00 and from 14:00 to 17:00. Given the number of calls we receive each day, it may be that our line is sometimes overloaded, so feel free to apply by email. Why favour a contact by email? We are constantly connected to our mailboxes and process your requests as soon as possible. The requests by emails are treated as a priority to our telephone calls. It is also easier for us to process your requests by email, we can access the history of your requests and be able to bring you a more relevant answer and more adapted to your needs. All our products are marked in our workshops based in Bordeaux and can be labeled « Made in France». As for the origin of the products, we carefully chose our suppliers to offer quality textiles and respecting our values in terms of environment and ethics. Our suppliers include the brand Stanley Stella, which is committed to a genuine approach to sustainable development. Which marking technique should I choose? This technique is the core business of Tunetoo and we are very proud of the quality achieved. All textile products are available in embroidery and on all personalisation areas. The embroidery is perfect for washing (do not use products containing bleach under the risk of seeing some colors of thread to fade) and over time. Gradients and very precise details are taken by our team to be compatible with the embroidery. The embroidery rendering is always submitted to you for validation before the launch of the production. Warning: photos are not achievable. Thanks to the latest generation equipment, we offer this technique for all your orders for textiles mainly made of cotton. The ink is sprayed directly onto the material to penetrate it. High-quality rendering makes it easy to tag from any image, regardless of the level of detail. After being heated for perfect fixation, the print will withstand up to 90 washings on average. We recommend washing at 30 ° maximum, upside down for a better longevity. We recommend this technique for any cotton textile with a print on the front or back. The image is printed on an extra-thin vinyl (80 microns thick) and then prepared for a hot transfer of the ink to your product. For any product with a majority of polyester, this is the printing technique to use. It is also the technique that allows printing on certain areas such as sleeves that are not accessible in digital printing. The fact that the ink does not penetrate the material makes it possible to have colors that contrast more, especially on a dark support, if you want a rendering with very bright colors on a black t-shirt for example. To achieve very fine elements, we may have to add an outline of the same color as the support to ensure the strength of the marking. The flex we use is a professional material, resistant to washes up to 90 ° for demanding environments such as cooking or high-level sports. Therefore, favor this technique for polyester products, sleeves and very vivid renderings on dark substrates. This technique is reserved for textiles and objects with a polyester coating. When this technique is possible it is usually the only alternative. The level of detail is excellent, as is the wash, whether it's mugs or cushions. On products such as hulls, cushions or some towels, this technique makes it possible to make an « all-over» marking of the product, that is to say on all the surface of the product, so do not hesitate to add a bottom of color. What is the quality of your products and markings? All products shipped from our workshop are checked at different stages of production to ensure optimum product quality such as markings. Our unique product catalog in Europe by its diversity offers you wide ranges by being transparent on the specificities of the products. For the t-shirt range, you will find first prizes in 150g / m² with a straight cut and 180g / m² fitted t-shirts or organic cotton t-shirts with tailored cuts. We offer you all the desired levels of quality while being sure to have quality basics. Our markings are made with the best tools on the market and expertise of almost 20 years in the business of personalisation. We invite you to watch the videos of our workshops on the site for a better overview. What are the products displayed in the « Artshop» section? This section highlights the work of professional or amateur designers who want to share their work and benefit from it. Part of the price of these products allows Tunetoo to ensure the production and shipping of the product, the rest is donated to the artist allowing him to develop his passion. You can use our filter and search tools to find the product that fits your need, whether it's expressing a message, offering a gift or buying a product with a design as styling as it is original..
All products in the Artshop collections are produced on demand. They are considered personalisation and therefore neither exchangeable nor refundable. In the personalisation tab, choose your product range then your product or click on « Personalise Now» to access our « Tuner». You can then upload your image, choose from our designs or write a text. You can also change products and browse our complete catalog. Click the view you want to display on the top right to customise the other available faces of your product. For each text or image, you can choose the marking technique to use. You can have several techniques on the same product if you wish. Then choose the size and quantity and add your creation to your cart! After putting all your products in your cart, click on « Order». Then you just have to fill in the necessary information for the delivery (postal address, last name, first name, email and phone number) and then proceed to the payment. For each product to be customised, Tunetoo also provides technical information and a measures table to help you make the right choice. Also read the product description for information on the style and the cut of the product, to consider depending on how you wear your clothes. What are the secure payment methods available? The payment module is fully secure. You can choose between a payment via Paypal (account opening is free) or a payment by credit card. If you are unable to pay by either of these two methods, please join our team at sav@tunetoo.com to arrange an alternative. If you buy several products of the same reference, you will have an automatic quantity discount (from 2 pieces). Discounts are shown for each product at the bottom to the right of the page (when you are on the customisation page). Depending on the products and the quantity, the discount can be up to - 80%. I can not put a product in my cart or validate an order? Our average production time are 10 to 15 business days (excluding weekends and holidays). Our teams do their best for an expedition as soon as possible. Upon shipment, our carrier takes over to keep you informed of the progress of delivery that takes place in 24 or 72 hours depending on your department for France. The personalisation of products being a random profession, these delays are average delays and are given as an indication. They can not justify a request for refund or cancellation of order. In which countries can I be delivered? We ship worldwide. When creating your account, when you enter your delivery address, all countries will be offered. For this reason, it is not possible to cancel an order. However, as long as the graphic work has not started, we are willing to make changes to the marking requested provided that it does not increase the price of the product. Although you can change your address in the settings of your Tunetoo account, the address chosen during the validation of your order will be retained. For any change of delivery address wished after validation of your order, thank you to contact us at sav@tunetoo.com by indicating us your order number and the desired address. Please note that the address has to be changed before the package is shipped. You can directly connect to your personal space on Tunetoo.com. In the tab « my orders», you will find the status and progress of your order. If you have placed your order for less than two weeks (10 working days), your order is most likely being processed without any particular problem. We invite you to wait a few days waiting for an email confirming the departure of your order. If you have placed an order for more than two weeks or if you have a deadline approaching, you can reach us by email at sav@tunetoo.com including your order number and the date of your event. We will give you more precise information on the progress of your order. When our service providers have taken care of your package, you will receive an email with a tracking link to track the routing of your package. Delivery is usually between 24 to 72 hours. (for a delivery in France). What if my package is not delivered to me? With your tracking number, we invite you to contact our service provider directly. They can give you more information about the location of your package. This delivery is made in 24h to 48h. The delivery of this parcel is done without signature, it can be deposited in your mailbox or deposited in a postal point closest to your home. A tracking link is sent to you by email, which will allow you to follow the routing of your package. If you encounter any problem on the delivery of your package, you can contact us at sav@tunetoo.com or contact directly La Poste who can inform you more precisely about your delivery progress. This delivery is made without signature. Your parcel can be deposited in your mailbox or deposited in the postal point closest to your home. If you encounter a problem on the delivery of your parcel, we invite you to get in touch directly with La Poste which will communicate you more information. When taking care of your parcel by our partner, a tracking link is delivered to you. You can then track the delivery of your package. If you have a problem with the delivery, please contact us at sav@tunetoo.com. We can on our side open an inquiry to obtain more information on the location of your package. Delivengo survey response times are 15 to 30 business days. This delivery must be done with a delivery against signature. You can select a delivery schedule for the passage of our carrier. If you are not present during the delivery, the parcel will be presented to you again at your place the next working day. Unfortunately, it is possible, during the transport, that certain parcels may have small small mishaps. In these cases, the transport company is responsible for the compensation. When the parcel is delivered by the delivery person, we invite you to thoroughly inspect your package. If it shows any sign of deterioration on the cardboard, but the goods are intact, we invite you to indicate it on the delivery note presented by the carrier. If your product has been damaged and becomes unusable, we invite you to take a picture of the package and a photo of the damaged goods. These photos must be sent to us within 48 hours of delivery to the email address sav@tunetoo.com. Beyond this period, we will unfortunately no longer be able to file a complaint with our carrier. We are committed to satisfying all our customers, so if the product received does not match the quality promises of Tunetoo or what you ordered, we are committed to doing the right thing to return your order. However, we will not refund, according to the law governing the activity of personalisation in the field of e-commerce. If your order does not correspond to what you ordered, we invite you to contact us at sav@tunetoo.com, to attach your order number and pictures of your product to illustrate the problem. We will get back to you as soon as possible to provide you with a solution to the inconvenience. All items in Artshop's collections are produced on demand. They are considered personalisation and therefore neither exchangeable nor refundable. I received my order, there is an error or a problem with my marking? Thank you for sending an email to sav@tunetoo.com including your order number, the problem found and photos to prove it (follow the procedure below). We will judge the legitimacy of your request and will compensate you if necessary by republishing your order or by crediting your Tunetoo account. It can happen that the personalisation is incomplete, of poor quality, badly positioned compared to the visual of the website or deteriorates after the washing. In order to be able to attest to the poor quality of the customisation of your product and proceed to a quick exchange, please provide us with a photo or several photos that clearly show every faulty print / embroidery. Our entire team will do their best to send you a quality product that reflects our expertise. Step 1 : Check your Tunetoo account for your order or your BAT (embroidery). Step 2 : Take a picture of the defective product(s). A) Measure and shoot the product. For this, position your product flat, fabric stretched.Make sure that the product label is visible in the photo to attest to the correct conformity of the product reference and the size. B) If you have several defective products: you must present each defective clothing on one and the same photo. 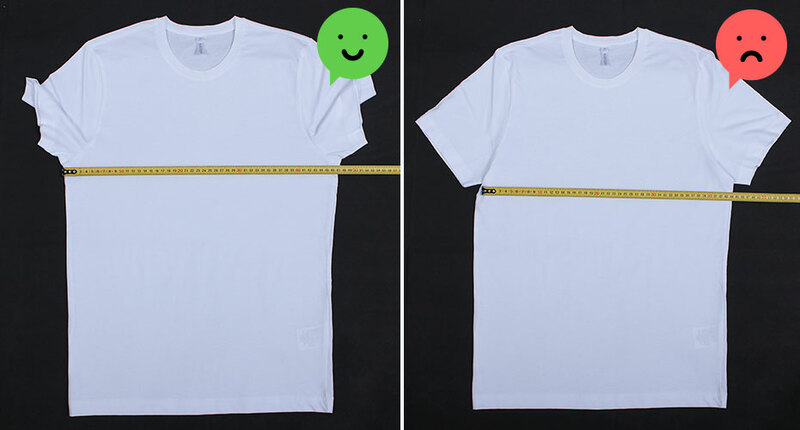 Exemple : I received 10 T-shirts with the size S. Of the 10 t-shirts I received, I noticed the following problem: - 2 sizes S are not marked correctly. 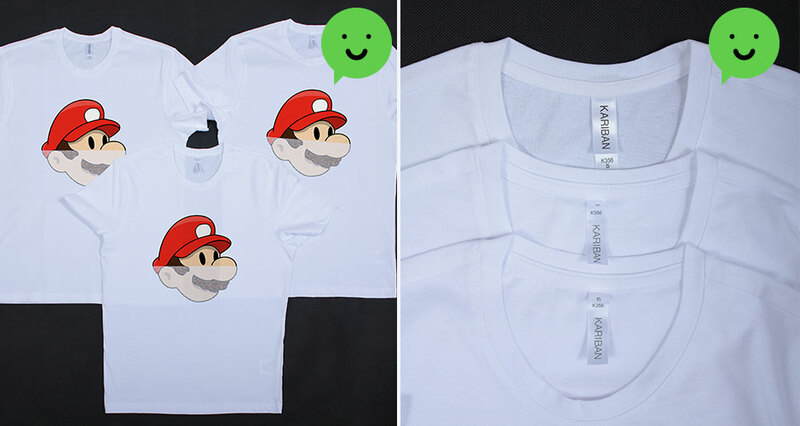 You must send us:1 photo showing the 2 t-shirts with the printing defect well in evidence. C) Check that all your photos are in good compliance with the rules of the procedure, have sufficient light and are recorded in high quality. The size of my product is not suitable, what to do? Your products being personalised, we do not offer any size exchange. That's why we put at your disposal on our website, a detailed sizing guide for each article. You can find this sizing guide below the product on our personalisation page. Do not hesitate to refer to the cutting instructions in our product description. If the size displayed on the label of the product received does not match with your order, thank you to send an email to the address sav@tunetoo.com with your order number and the photo of the label in the neck of the product (see our defective size claim procedure below). If error on our part, we will reissue your order as soon as possible. If the displayed size is correct, it may be an error on the part of the manufacturer. Please check the measurements posted on our website. If these do not correspond, we invite you to send us an email with the address sav@tunetoo.com, a photo of the product with a meter placed on it to prove the difference with the measure announced. If the measurements displayed on the website correspond to the actual measurements of the product (within a margin of error of +/- 5% manufacturer), the responsibility of Tunetoo can not be engaged. It may happen that the size of the product received does not match the size indicated on the label. A problem of labeling could occur at our supplier. To facilitate and expedite the exchange procedure, please follow the claim procedure below. Step 1 : Verify that the measurements of the product received have a difference greater than 4% with the size chart provided on the website. To start please read the size chart of the concerned product on our website (Table available with the product description). Important : Important: The Photo and the respect of its instructions are obligatory for the claim. In order to be able to attest to the size discrepancy, it is important to provide us with photos that clearly show the measures of the product. A)Measure and shoot. To do this, position your product flat, fabric stretched and measure with your measuring tool. Please leave your measurement tool visible on the photo. Make sure that the product label is visible in the photo to attest to the correct conformity of the product reference and the size. B) Check that all your photos are in good compliance with the rules of the product, have sufficient light and are recorded in high quality. The product must be fully visible on the photo. The measuring tool must be placed in such a way as to respect a rectilinear trajectory and as directly as possible between the two measuring points. In general, the measurement points differ little according to the products. The measurements on the website are height and width measurements, with an average tolerance of 3 to 4% depending on the suppliers. Measuring points : The measuring points are generally arranged to measure the dimensions of the fabric panels. The measures on our website do not necessarily correspond to waist or chest. B : Bottom of the garment: this point is at the end of the garment. C : Top Seam: This stitch is on the seam joining the front panel and the back panel with the top of the sleeve. D : End of round: this point is at the end of the round. E and F: Channel Seam: This stitch is on the seam joining the front panel and the back panel with the bottom of the sleeve. I need my order for a specific event, how can I do? We do not provide any delivery with a specific date, the personalisation work being too random. Our team is available by email (sav@tunetoo.com ), by phone ( +33 5 56 31 09 55 ) or via the website's instant messaging to get information about your requirements and deadlines. Once informed, the information is passed to the workshops who will do everything in their power to meet your deadlines. Do not hesitate to send us your wishes so that we can make our arrangements but do not consider this as an insurance. 1. Free : Whether you sell 1,000 products a week or you can not sell one, you can do it for free. Tunetoo produces only what you sell and gives you a commission on the amount of the sale, paid by the end customer. 2. Serenity : you create and communicate, we take care of everything else: order taking, production, shipping, after-sales service ... you have nothing to manage, simply to recover your commissions. If you do not even want to communicate, then become a Designer and take advantage of visiting our website to sell your products. 3. Flexibility : thanks to 3 different sales channels, a product catalog of several hundred references, mastery of all the internal marking techniques and a team constantly at your service: you can do everything with our platform! In summary, a reseller is a person who sells a product (s) or a design(s) of its creation by entrusting Tunetoo all logistics. For this he can use a shop, a campaign or be designer and rely on the visibility of our website and our production device to develop its business. It is also possible for us to operate totally in white label by connecting to a shopify shop or Woocommerce. So test us! What is the difference between the 3 proposed sales methods? SHOP: you choose the selling price of the product and we charge you a basic price corresponding to the production of an article. Your margin is the difference between the two. CAMPAIGN: you also choose the selling price of the product but the basic cost depends on the number of products sold. As production is grouped, the more sales you make during the campaign, the lower the base cost and your margin increases. DESIGNER: The selling price and base costs are fixed. Your margin is predefined. In this case, 10% of the public sale price. SHOP: you have to create the products then make the communication of your shop. We also propose you to be in white label in order to develop a true brand image totally independent of Tunetoo. Your job is therefore both in creation and marketing. CAMPAIGN: your role is also to create and share. Either you have a specific community and this work is quite simple (members of your association, colleagues ...), or you want to target individuals likely to recognize themselves in your creations. Then, you do a « marketing t-shirt », a practice that requires to look at the use of social networks to increase sales through Facebook Ads and Facebook pages. DESIGNER: we are simply counting on your creativity. You propose designs that are available on our website and can be found via the different categories, keywords or if they had put forward by our team. Once the pattern is integrated, you have nothing to do, except to integrate another. SHOP: you can make available all year round products and launch productions to the unit. You are also more independent of Tunetoo and can create your own brand image. CAMPAIGN: As for a flash sale, the goal is to make volume to increase your gain. It is a job that requires investment and may have a cost if you want to spend money on communication, for example on Facebook advertising. You are usually attached to a Facebook page and not to a site, so the image is different and you can sell very different products more easily. DESIGNER: This is an activity that will take you little time, a simple way to monetize your work next to your main activity.Many gateways exist between the 3 methods and we will continue to work to simplify and bring closer the modes of sale. What is the Designer mode? Designer mode is for professionals as well as amateur graphic designers. This mode consists of proposing patterns that visitors to the site can find in the Artshop part. Each motif is associated with keywords and categories to allow visitors to easily find the patterns that interest them. The Designer chooses for each pattern on which products he wants to declined it. Tunetoo manages customer acquisition and communication, you just have to reap the benefits. Your commission is 10% of the selling price of the product. How am I paid on the sale of designs as Designer? You get a commission of 10% for each sale. So your commission will be higher on a more expensive product (like a sweatshirt) than on a t-shirt or a tote bag. The selling prices are set by Tunetoo, so you do not decide on your commission. As a Designer, can I choose the products I want to display my designs? We offer different product worlds and you can choose on which you want to see your products declined. When you choose a universe, all products are automatically created. Can I choose the colors of the products on which I would like to display my designs? We give you the option to choose a default display color when creating the pattern. Are all my designs instantly available on your site? We agree to check each reason before making it available on the site. The products are therefore accessible once they have been validated by our moderation team. We will not allow grounds for hatred or racism, copies or reasons of insufficient graphic quality. What are the purpose of the descriptions, titles, tags and categories to define for each design? These elements are very important because they will serve to highlight your designs during visitor searches and increase your chances of making sales. Make sure to use as many keywords describing the design in the description part and fill them all in the tag field. Then, choose the categories related to your reason. A campaign consists in selling one or more products with the same reason for a limited time in order to make a group production and lower the basic cost of the product. Sell ​​your product at a lower price while increasing your margins compared to a shop. To place a group order for an association or a company while reaping profits for the organization of other events. Raise funds for a cause you care about. What is the purpose of selling the campaigns? The goal is simply an indicator that allows you to predict how much you will get from your campaign. Start by adding all the products you want to include in your campaign and set the selling prices. Then move the cursor over the objective bar, then we calculate your profit (or the range between minimum and maximum profit). When you launch the campaign, the goal does not matter and it is the actual number of sales that will calculate the commissions. Are my campaign customers being charged right away? The campaigns are necessarily profitable or in equilibrium from the first sale. Your customers are debited automatically since whatever the outcome of the campaign, a single command is enough to launch it. How are the campaign commissions calculated? We take into account the total number of sales of your campaign. For this reason, your commissions cannot be defined in advance. Ex : you sell a t-shirt 150g printed 19,90 € VAT. 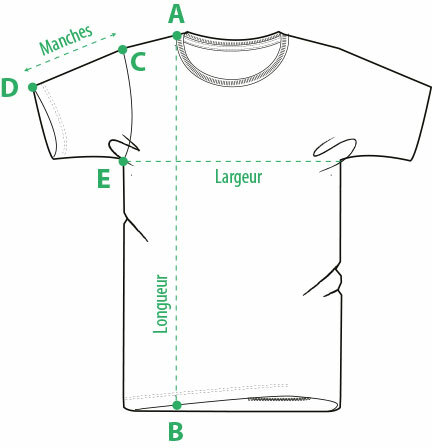 If you sell 5 white t-shirts, your unit commission will be 6,60 € VAT. If you sell 20 white t-shirts, your unit commission will be 11.00 € VAT. CAUTION: For some products, colors may have a different base cost. Whites are often the cheapest and chained colors can be more expensive on Stanley Stella products. Your final commissions incorporate this price difference so you will not get the same if you only sell White or if you only sell Slub Heather Gray. In case you do a multi-product campaign: The total sales number is used to define the unit margin of each product. Ex : you are campaigning with men's t-shirts (5 sales) and round neck sweatshirts (15 sales). We will calculate the base cost of your t-shirt for 20 sales and the base cost of your sweatshirts for 20 sales. From there, we get your unit commission per product. Your final commission = 5 x unit commission t-shirt + 15 x unit commission sweatshirt. What are the production and delivery deadlines for the various reseller modes? The deadlines are the same according to the different sales methods. On the other hand, as far as the campaign is concerned, the deadline is from the end of the campaign. Are you cheaper than the competition? On the campaign side, unlike the competition, we offer decreasing prices allowing you to make more money when your campaigns are successful. Depending on the products, our costs can start from higher on small quantities to ensure a long-term health of this sales method. Offering hundreds of references instead of a dozen requires different management of stocks which explains the difference with some of our competitors. But the difference is quickly caught and we are sometimes cheaper in a room ... not to mention most of our products available nowhere else! What is a Tunetoo online shop? A Tunetoo online shop is an area of ​​your own where you can sell products created using our Tuner. You set your commission for each of its products and you are ready to sell them. You can start a brand without any investment or risk. We take care of absolutely everything. You can have a Tunetoo online shop, hosted free of charge with us. You can integrate the free Tunetoo shop in your personal or professional site in Iframe. You can associate your Tunetoo store and your Shopify or Woocommerce site, we then operate as a complete white label. Are you compatible with Shopify or Woocommerce modules? Shopify or Woocommerce integration is possible with Tunetoo. You create your products from our website and they are immediately available on your e-commerce website. All the logistics from payment to delivery is handled by Tunetoo and you focus on the sale. What are the commissions via the online shops? The amount of commissions is free. Tunetoo sets the basic cost of the product, plus your uncapped commission. The sale price displayed on the site will be the sum of these two amounts. Do we have a sliding scale if our shop sells volume over the year? Depending on your business volume, an update of your basic costs can be made. Please contact our sales department for more information on 05 56 31 09 55. Can we use multiple reseller modes in parallel? Our different sales methods are completely complementary and we encourage as soon as possible to multiply the sales methods to increase your chances of selling and generating profits.